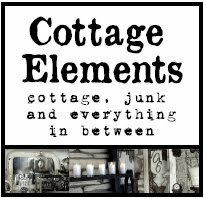 Cottage Elements: The French Flea Opens on Thursday! 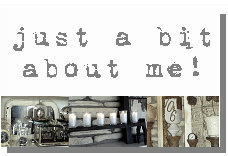 If you like white like I do, this is definitely the month to visit The French Flea! This month's theme, "Vintage-White Garden Party" has what it takes to satisfy your white urges, along with some color to meet all your needs! Before you even enter the store, there are goodies to wet your whistle. The bright yellow motel chairs, along with the polka dotted patio chairs are just the ticket to draw you in! Once you enter the store you'll find an array of items and vignettes that are put together in the usual classy French Flea fashion. The cozy love seat found towards the front makes you want to grab a book and settle right on in. And the coffee table found along side it, has it's own unique charm with the word "Bordeaux" stenciled on the top. 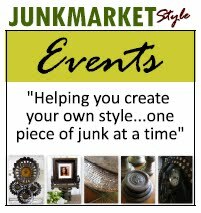 In fact, there are so many one of a kind items and restored vintage pieces that you'll just have to come in and see them all for yourself. The French Flea opens this Thursday at 10:00, but you may want to get there early as there usually is a line forming outside the front of the store. Also on Thursday from 4:00 to 8:00 is Anoka's Girls Night Out, come back for some munchies and refreshments. For stores hours and future sale date you can go to their website at www.frenchfleamarketofanoka.com. But for now, just sit, listen to the music and enjoy the pictures! Guess I'm up here in Canada, just so I don't go into debt in that store..I need those wonderful yellow chairs, just the thing for my balcony garden!